We may be down, but we are NOT out! Living with a chronic illness can be limiting in many ways, but adjusting to those new limitations and having a solid understanding of what you CAN do is really important. Even if you know you can only be active for 4 hours a day, that should serve as the basis for planning your days.. The biggest pittfal to this way of thinking is comparing yourself with others energy or abilities. That is not your reality and is not helpful. Base your life on your abilities, not societies expectations. Because even if you touch one life with your time or simply make a connection during your active 4 hours, it is better than nothing. Set a goal for yourself, and work on it each day as much as you can. When we go, our life’s work will not be measured against another persons, it will be measured against the truth of our own Soul. So don’t give up, and DO IT ANYWAY! 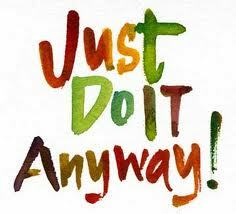 An example of how this mantra can help you is when your internal voice goes negative on you- “I don’t feel good” say mantra, “do it anyway”….apply this anytime your pain body tries to gain control, and you will be very happy with what you will accomplish!